Most of the granola you get at the health food store is not healthy. Learn how to make your own! Even if organic, low in sugar, or homemade, it can be hard to digest and has little nutritional value. Granola is traditionally made with oats. Oats are a seed, and like all seeds, have anti-nutrients like phytic acid that block the absorption of minerals and enzyme inhibitors that make digestion difficult. Neutralizing and minimizing these anti-nutrients by soaking them raw in an acidic medium (for grains and legumes) maximizes absorption of nutrients and digestion. The problem is that most of the oat-based store-bought granola is not soaked in an acidic medium before going through whatever heating process it goes through to become crunchy. If you’d like to buy a healthy granola, you should be able to find at least one brand of raw granola in the raw food section that will probably be like mine below–made of nuts. My grawnola is made with properly prepared nuts and seeds. It is so good I ate it within a few days the first time I made it. However, nuts and seeds are high in Omega-6 fats, which should be limited. Only eat 1/4 cup a day at the most. Just like grains and legumes should be soaked in an acidic medium to neutralize the anti-nutrients, nuts and seeds should be properly prepared as well. This requires soaking in filtered water with salt. The salt activates enzymes that neutralize the enzyme inhibitors. So if nuts have given you poor digestion, constipation or gas in the past, try soaking them this way! Obviously you can choose whatever nuts and seeds you like and use whatever amounts you like. The following recipe is just what I used. I dehydrated soaked nuts and fresh fruit in my dehydrator. It comes out crunchy-soft and I love the pieces with the banana! You can also bake the grawnola in an oven at the lowest setting, but it won’t technically be raw because any temperature over 120° is not considered raw. *Prep ahead: Soak nuts and seeds in salt (1/2 t per cup of nuts) for at least 8 hours, preferably overnight. After soaking nuts and seeds, rinse and drain. Pulse the almonds in the food processor until roughly chopped but not pulverized. Remove from food processor. Pulse the pecans and walnuts together until roughly chopped. Nuts will not chop evenly so be careful to not over-process; there will be different sizes of pieces. In a large mixing bowl, combine nuts, seeds, apples, bananas, honey, cinnamon and nutmeg. 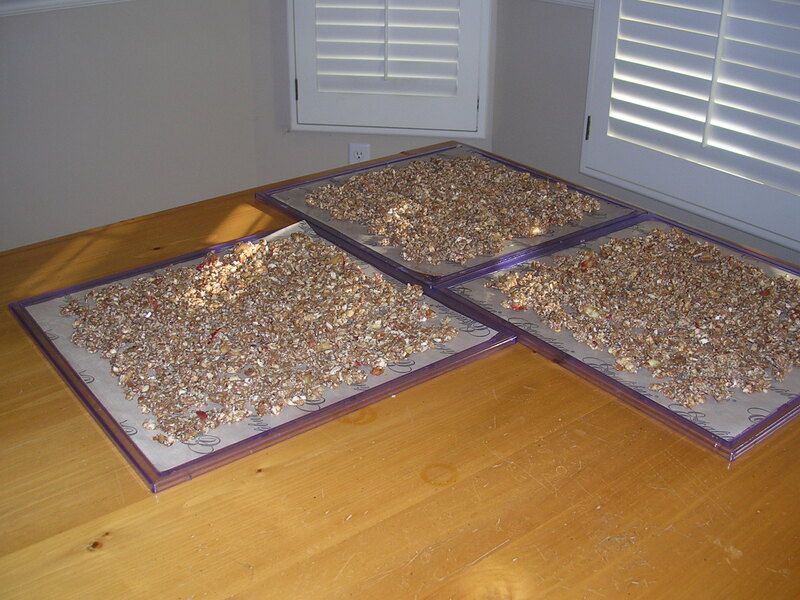 Spread mixture onto trays (makes four trays) and dehydrate for 10 to 12 hours at 115 degrees. Add coconut and raisins to finished grawnola. Keep in refrigerator for long-term storage. Note: I am very pleased with my 5-tray Excalibur dehydrator because it has a temperature setting to dehydrate at temperatures below 120 degrees, the temperature over which enzymes and nutrition is destroyed. I also love it because the trays are removable so I can place my glass liter jar of yogurt in it to ferment.